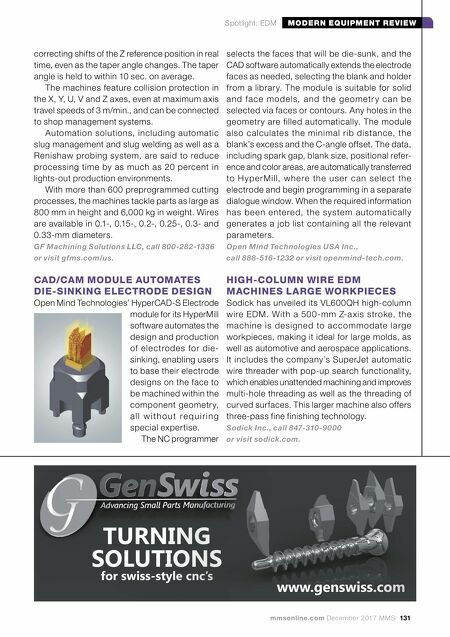 130 MMS December 2017 mmsonline.com MODERN EQUIPMENT REVIEW Spotlight: EDM Four-axis pocketing automatically identifies and isolates the largest area inside a complex cavity that can accommodate a slug drop. The core area is removed with a simple t wo-a xis contouring operation, and the four-axis no-core pocketing wire removes remaining material. T h e s o f t w a r e a l s o i n c l u d e s f e a t u r e s to facilitate unattended machining, such as machin- ing strategies for safe slug removal and reports fo r o p e r a ti o n c yc l e ti m e s, tot a l c yc l e ti m e, thread locations, wire and workpiece data, and setup instructions. 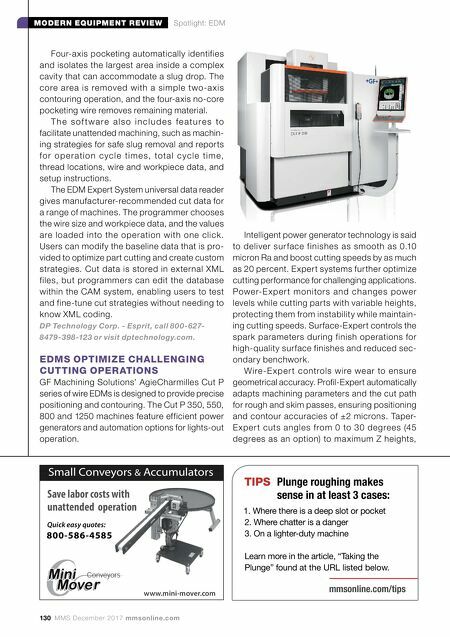 The EDM Expert System universal data reader gives manufacturer-recommended cut data for a range of machines. The programmer chooses the wire size and workpiece data, and the values are loaded into the operation with one click. Users can modify the baseline data that is pro- vided to optimize part cutting and create custom strategies. Cut data is stored in external XML files, but programmers can edit the database within the CAM system, enabling users to test and fine-tune cut strategies without needing to know XML coding. DP Technology Corp. - Esprit, call 800-627- 8479-398-123 or visit dptechnology.com. EDMS OPTIMIZE CHALLENGING CUTTING OPERATIONS GF Machining Solutions' AgieCharmilles Cut P series of wire EDMs is designed to provide precise positioning and contouring. The Cut P 350, 550, 800 and 1250 machines feature efficient power generators and automation options for lights-out operation. Intelligent power generator technology is said to deliver sur face finishes as smooth as 0.10 micron Ra and boost cutting speeds by as much as 20 percent. Expert systems further optimize cutting performance for challenging applications. Power-E xper t monitors and change s power levels while cutting parts with variable heights, protecting them from instability while maintain- ing cutting speeds. Surface-Expert controls the spark parameters during finish operations for high-quality surface finishes and reduced sec- ondary benchwork. W ire -E x pe r t controls wire wear to ensure geometrical accuracy. Profil-Expert automatically adapts machining parameters and the cut path for rough and skim passes, ensuring positioning and contour accuracies of ±2 microns. Taper- E xper t cuts angles from 0 to 30 degrees (45 degrees as an option) to ma ximum Z heights, Save labor costs with unattended operation Small Conveyors & Accumulators 800-586-4585 www.mini-mover.com Quick easy quotes: mmsonline.com/tips TIPS Plunge roughing makes sense in at least 3 cases: 1. Where there is a deep slot or pocket 2. Where chatter is a danger 3. On a lighter-duty machine Learn more in the article, "Taking the Plunge" found at the URL listed below.